This is the perfect tee for weddings, dinner parties and court dates. Public corruption in Illinois is nothing new. In fact our Governors have been making our license plates since 1974. In case you were just born yesterday or you don’t know your Illinois history: OTTO KERNER — Governor from 1961-1968. Resigned to become judge, then was convicted of bribery related to his tenure as governor. Sentenced to three years in prison………….. DAN WALKER — Governor from 1973-1977. Pleaded guilty to bank fraud and other charges in 1987 related to his business activities after leaving office. Spent about a year and a half in federal prison………….. GEORGE RYAN — Governor from 1999 through 2003. After leaving office, was convicted of racketeering for actions as governor and secretary of state. In November 2007, began serving a 6 1/2 year sentence in federal prison………….. ROD BLAGOJEVICH — Governor from 2002 through 2009, when he became the first Illinois governor in history to be impeached. Convicted of numerous corruption charges in 2011, including allegations that he tried to sell or trade President Barack Obama's old Senate seat. This version of our logo was drawn by local tattoo artist Don Will. We have been so busy moving the shop around that we have been slacking on posting new arrivals at the shop. 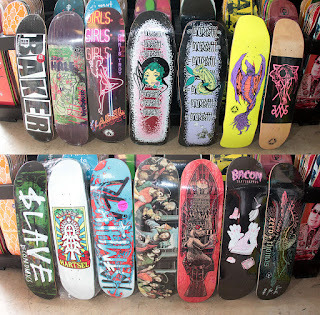 But we have some new DECKS (Baker, Birdhouse, Black Label, Scram, Welcome, $lave, Prime, Deathwish, Pizza, Coda, Bacon and Zero) and we also have new WHEELS, BEARINGS and more. As some of you already know THE SHOP IS MOVING! Don’t worry, we aren’t going very far. 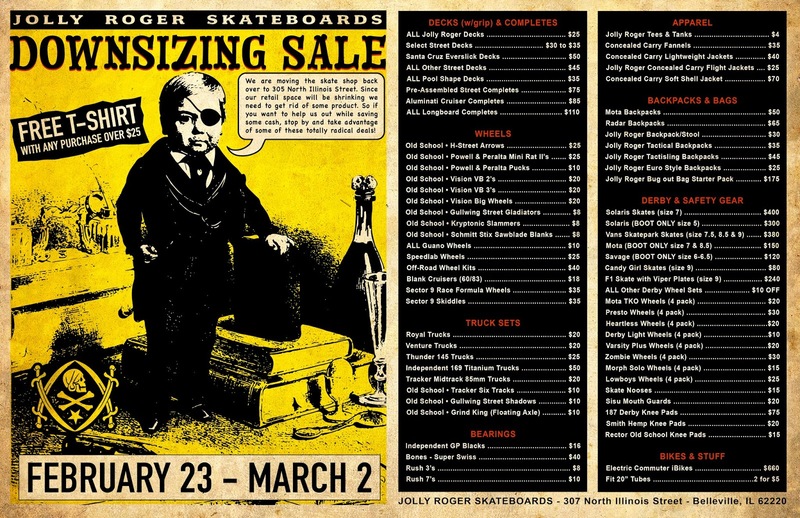 We are just moving the skate shop back over to our original location at 305 North Illinois Street. 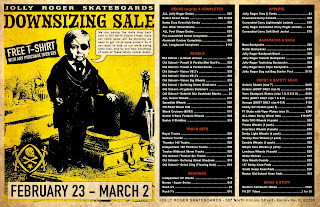 Yeah, thats right, we are going to be cramming as much as we can from the skate shop over into our print shop. As you can imagine we are not going to be able to take everything with us over to our new space so in order to accomplish our objective we need your help in getting rid of some product. 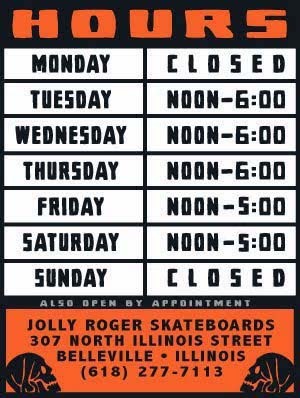 NEW BUSINESS HOURS for 2019! We will be taking Sundays off and changing our hours on Friday and Saturdays. *With that being said, if you need to stop by the shop on any day that we are closed (Sundays and Mondays) just get a hold of us during regular business hours and we can schedule an appointment that works for you. We are usually closed on Mondays but we will be open on Christmas Eve from NOON to 4:00 for any last minute shoppers. *Everything in the shop will be on sale because sometimes it pays to procrastinate.